It has been a while since I cooked a big juicy steak for the family dinner. There's no reason for it other than I just kind of forgot about it. How do you forget about steak? To tell the truth I forget about a lot of different flavours and meals this time of year, it's what ever is leftover in the fridge, or I double up on what I am cooking for a function. October through to December it is pretty much 15 minute meals in our house! I was at work yesterday when a colleague came in with a bottle of Shiraz and started telling us about how good it was, and how it is on sale....and did we want to buy a case?.... Of course a tasting was in order before buying anything and seeing how it was after 12pm all was OK. The wine was very quaffable and moreish so I put in my order for a case on the spot. I was also lucky enough to be the only one not working a dinner party that night (I had a canape drop off- yippee!). So I was the lucky one who took the bottle of red home to drink with.....STEAK! See how my brain works? Anyway, off to the butcher I went and picked out some fabulous New York strip steaks for tea. If your buying a good quality steak you really want to taste the meat so I don't over do all the trimmings. A simple potato mash (I leave the skin on which drives Nic a little mad! ), steamed beans tossed with a hint of olive oil and lemon juice and a delicious mushroom sauce. -'You shouldn't do that mum, you could burn the house down!' says Max with a serious look on his face while Alex looked on horrified. 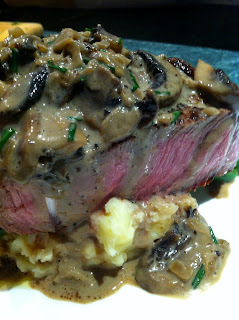 Thankfully I managed to keep everything under control and we sat down to a forgotten family favourite of steak and mash that tasted wonderful, especially when served with a smooth bottle of Shiraz. I smiled when I saw your blog pop up with a new post! Great to hear from down under! Steak and Shiraz sounds good anytime!